Modernity Grp. is a hardware and software distribution group, formed in the Spring of 2004. The goal of Modernity Grp. is to import modern Commodore technologies from around the globe and make them readily accessible to North Americans. Modernity Grp. presents, demonstrates and sells its product line at the biggest Commodore shows this side of the ocean, as well as accepting and supporting Mail Orders to anywhere in the world. We are pleased with the line of products we make available, and may be looking to expand our line of support in the future. 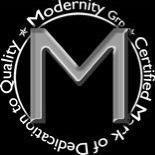 Look for the certified mark of Modernity Grp. 's dedication to high quality hardware and software, for the Commodore 64 and 128 personal computer. Order Info: Orders can be placed online now using the PayPal secure online payments service. You do not need a PayPal account to buy something with it. More information on how it works can be found here. Items for which the "Buy Now" button is not available means that the item is not currently in stock. When stock comes in, the button will be activated. Please contact us with any inquiries about products and availability. Note to Developers: Contact Modernity Grp. and request information about developer's offers, discounts and product availability. Developed and released in 2004, the IDE64 v3.4 is the 4th generation of IDE64 since its original debut in 1997. The IDE64 provides the fastest, highest capacity and least expensive independent storage solution yet available for the Commodore 64. IDE64 v3.4+ builds on the IDE64 v3.4 by doubling the size of PEROM chip, and providing a toggle switch to support any two versions of the IDEDOS at the same time. If you have a SuperCPU, but you want to use the IDE64 on a stock system too, you are no longer locked into one mode or the other. The IDE64 v3.4+ comes configured with the latest, WiNGs compatible, SuperCPU IDEDOS available, as well as the new v.9x IDEDOS which is still under development. The utilities disk also includes the new and greatly improved v1.2 perom programmer utility. The IDE64 is much more than a simple drive adaptor, it is an interface for a multiplicity of modern devices with the ability to expand. The IDE64 interface allows the connection and use of common ATA harddrives, CD-rom drives, and now ultra small and quiet Compact Flash cards. An expansion port known as the shortbus allows for a growing line of new devices to be connected as well. 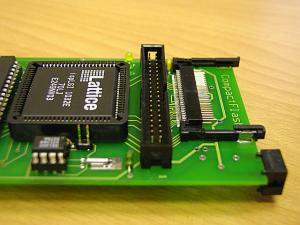 Currently these include dual highspeed (115k) serial ports, and a 10 megabit ethernet adaptor. Storage capacities reach unmatched levels, with partition sizes upto 8 gigabytes. Native access to PC CD-roms allows for direct access to the content of a CD from the READY. prompt without needing to use a copy utility first. And it's ready to play music CD's right out of the box. Nothing makes the WiNGs Operating System shine like the incredible speed of the IDE64. Opening large applications, playing digital music stored on the harddrive, and loading in and watching large movie files becomes painlessly fast with the IDE64. The IDE64 matches the CMD RamLink in speed, but offers hundreds of times the capacity at almost half the price! 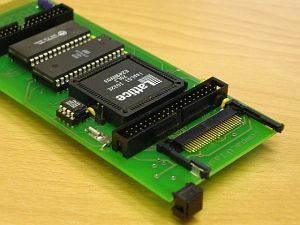 The IDE64 is compatible with a wide variety of other Commodore expansion devices including the SuperCPU, RamLink, CMD HD, JiffyDos, Turbo232/Swiftlink and EX3,EX2+1. Also features a built in RTC capable of setting the BASIC clock and WiNGs system clock. A floppy disk speeder, an autoboot file, machine language monitor and a convenient and powerful built in two panel file manager. IDE64 Package - $149 USD Tax and Shipping Included! Included is a Bonus CD-Rom disc loaded with over 500 megabytes of pure media files. Media includes Music, thousands of classic SID tunes, and over 60 full length digital songs, 10 Photo galleries, which contain over 200 photos in all. The newest addition to the WiNGs multimedia capabilities are Movies. 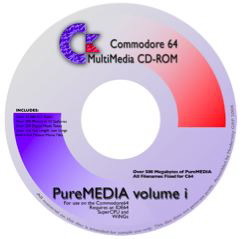 PureMEDIA volume i includes 6 motion movie files. This CD can be accessed directly with a CD-rom drive connected to an IDE64. A true library of literally hundreds of megabytes of pureMEDIA. - Only Available as Packaged With Other Offers. Having trouble downloading or installing WiNGs? Don't have a connection to the internet? Order WiNGs on a 3.5" 1581 (FD2000 compatible) diskette. Diskette contains Ajirc, FTP, Mail v2, Fileman, Josmod, Wavestream, The WiNGs Movie Player and more. 18 pages, colour, card stock cover. Contains installation, maintenance, upgrade and programming instructions. As well as an overview of the builtin utilities. Replacement for the battery which comes with the IDE64. 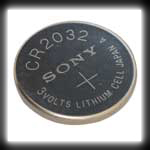 This battery keeps the RTC's date and time set, as well as the custom setup options. * Unless otherwise stated, Shipping and handling is included in the list price. * Products may not be exactly as shown.